The BASICS – For several years the Jaeckels knew they wanted to retire in Sedona, but they feared a lackluster slow social life. When their Realtor suggested that their outgoing personalities would make them ideal B&B hosts, it seemed a natural solution. After selecting a lot six years ago based on outstanding views, and taking four years to design their own ideal inn and custom home using a $40 computer program, they are living their dream. Their B&B opened last August. The UNIQUE – One room is professionally equipped for spa services. Kathy Jaeckel is a professional esthetician who offers a variety of beauty treatments. Massages and other treatments are provided by a visiting massage therapist. Outside, the 4,300-square-foot, adobe-style inn is a light-red pastel that blends with the surrounding red rock landscape. Inside, the décor is a mix of contemporary art and furniture. Some walls are curved, while others are angled so each window takes advantage of the picturesque surroundings. Throughout are enough niches and built-in display nooks to conduct an hourlong house tour. A second-floor walkway open to the great room below is finished with glass panels. The GUESTS – Since the inn only opened recently, most guests have come from the greater Phoenix area. The inn’s website is beginning to attract visitors from around the country. 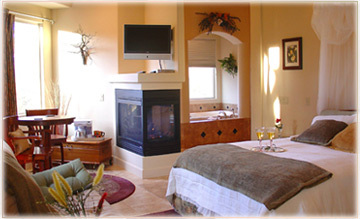 The ROOMS – There are only two guest bedrooms, each a suite with approximately 450 square feet. Both include a large sitting area, bedroom and extra-large bathroom. Picture windows have spectacular views of Cathedral Mountain, one of the most photographed landscapes in Sedona. One bedroom has a private balcony and the other has a ground-floor patio. Both have see-through fireplaces visible from anywhere in the suite. Room amenities include plush robes, instant-on hot water, flat-screen plasma TVs that swivel to be seen from anywhere in the room, two-person walk-in showers, two-person Jacuzzi tubs, iPod jacks with in-room surround sound, DVD players, wireless Internet and a selection of pillows. Beds feature Select Comfort mattresses with a pillow-top and additional-memory foam topper for maximum comfort. There is also a microwave and small refrigerator in each suite. Each room has full access to an armoire filled with games, a treadmill, a set of weights, gas grill, horseshoe pit, a telescope to view the night sky, and any of several patios used to enjoy the daily sunrise or sunset. Bath amenities include a full selection of Superior Skin Secrets products, a line of skin products manufactured and sold by Kathy. 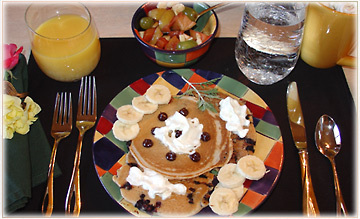 The FOOD – Selections are made from a menu of 20 breakfast dishes. Hungry guests may have as many choices as they want. One entrée is a round “egg pizza” prepared with fresh spinach, tomatoes, bleu cheese plus any other ingredients. Each afternoon guests are treated to homemade snacks, including hot soup, ice cream, freshly baked cookies or a “power” fruit smoothie. Sometimes guests are surprised with specially prepared afternoon treats. A visitor who expressed a love for peaches found a peach pie waiting after a hike. 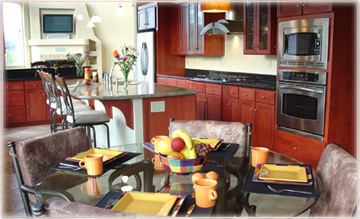 A complimentary basket full of freshly baked and packaged snacks and fruit is placed in each room. “We want our guests to leave full,” Larry says adding that one visitor remarked that he had been fed so much during his stay, the inn should come with a gym membership. The HIGH POINTS – The Jaeckels function more as private concierges than innkeepers. 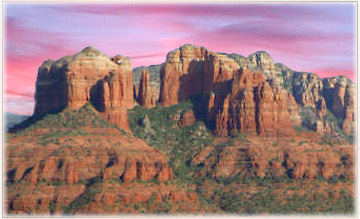 The inn is less than 10 minutes by car from Sedona, and a 10-minute walk to picturesque Red Rock Crossing Park. 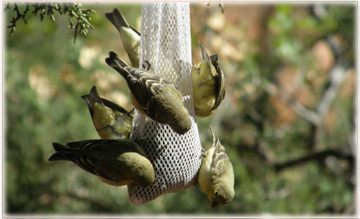 Guests who prefer to stay at the Inn without leaving may see more wildlife than those who spend each day hiking in the surrounding Coconino National Forest. Coyote, javelina and mule deer are frequently seen on the Inn property. Most evenings a covey of quail scurries across the yard. THE LOW POINTS – Travelers uncomfortable being pampered may find they receive too much attention. Or, maybe, they will find out they like it after all. THE BOTTOM LINE – The first-floor room is $285 weekdays and $305 weekends. A slightly larger room on the second floor is $320 weekdays and $340 weekends. Prices include all amenities and food. A two-day stay is required on weekends, but includes a selection of some spa treatments. 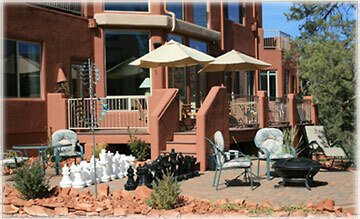 Visit www.sedonacathedralhideaway.com or call 1-866-973-3662.